HEAVY DUTY Reversable soft Flannelette Waterproof Mattress Pad with extra wide support straps to hold pad firmly in place. Excellent for bed-wetting, invalids, guest beds etc. Buy 2 for complete protection when one is in the wash. Washable--Made in USA. Please note: We now carry new specialty mattress sizes including 3/4 bed size, XL twin, carriage/cradle, crib/toddler bed size, Standard (dual) King, California King, Western King and high risers. Note: This pad is not intended to cover the entire mattress, but it does cover a significant part including all areas usually subject to bed-wetting. 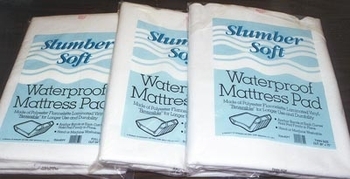 If you would like to cover the entire top of the mattress, please order our waterproof fitted pad. Our heavy duty flannelette waterproof mattress is the ideal protection for any mattress. Laurens Linens waterproof mattress pad laminates a waterproof membrane between layers of soft flannel which is more comfortable and quiet than conventional vinyl covers. The extra wide anchor straps allow it to be used on virtually any mattress.